Grow roses? You’ll want to read about Rose Rosette Disease! If you grow roses you may have heard of a deadly disease called Rose Rosette, also called “witch’s broom”. If you haven’t, then now is the time to learn about it, especially if you have Knock Out® roses, or any kind of rose, in your landscape. Over the past year, we’ve seen a big increase in this viral disease all around town. This devastating disease is transmitted by a tiny mite called Phyllocoptes fructiphilus. The disease infects only plants within the genus Rosa, which includes all roses and can spread quickly from plant to plant. Witch’s Broom growth on a rose plant. The most noticeable symptom of rose rosette disease that the stems grow into a shape called “witch’s broom”. A multitude of stems growing en masse with dense clusters of thorns. Unfortunately, this also could be confused with drift from broadleaf weed killer. If you notice the “witch’s broom” growth plus any other symptoms, it’s best to call a professional for a sure diagnosis. Excessive thorn growth along rose stems. 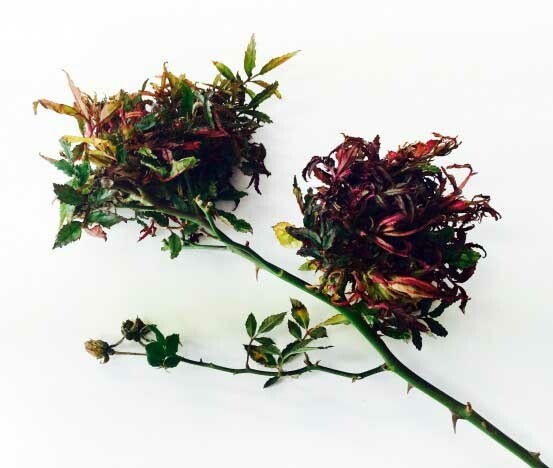 Rose Rosette Disease can take up to two years to kill your rose plant. But in that time, the mite that causes it, will have most likely spread the virus to other roses in your landscape, your neighbor’s landscape, or all over your neighborhood. Because the disease is a virus, or is virus-like, there is currently no cure. 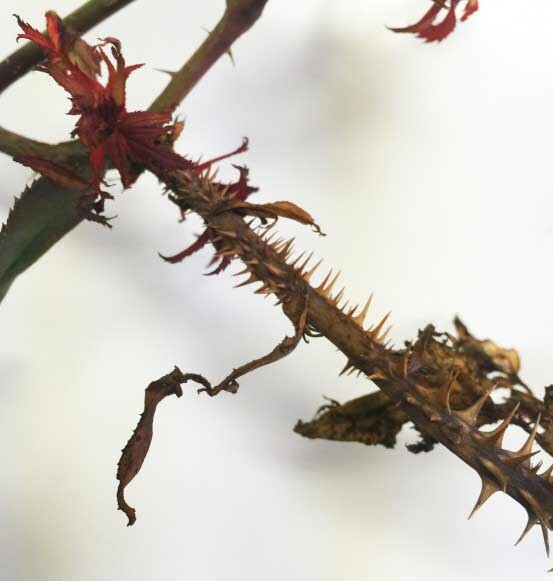 The best treatment is to completely remove and destroy the infected rose plant, including its root stock, as soon as you see signs. Do not put it in the compost pile! Place it directly into the trash. It is often thought that this disease only affects KnockOut® roses because there are so many planted around the DFW area. Unfortunately, it can infect any rose variety in your garden. So you pull out all your infected roses, can you plant new roses? It’s not advisable to plant new roses into the same area, at least not for a year or two. Even small pieces of infected root system accidently left behind in the soil can sprout new infected shoots. Plus, if your neighbor’s roses have the disease, it’s only a matter of time before it will most likely be transmitted back to your new roses. Treatment: Currenly, systemic miticides available to homeowners are not effective against the mite that spreads rose rosette. It is thought that preventative early spring treatments for mites, such as insecticidal soaps, horticultural oils or other natural miticides could help protect uninfected plants from becoming infected. Customers who are part of our year round Soil Building Program will have the added benefit of our staff on your property throughout the year to inspect your lawn and garden for any pest or disease issues that must be addressed. Again, the best treatment is remove of infected plants, including their entire root system. Could your roses be infected? Give us a call if your rose plants, or even a neighbor’s plants, look suspicious.